The Grand Coulee Dam is a dam on the Columbia River in the United States state of Washington. The dam forms Lake Franklin D. Roosevelt. The dam was built between 1933 and 1942, with a new power plant added between 1997 and 1974. The dam is operated by the U.S. Bureau of Reclamation. Grand Coulee Dam is 168 metres (551 ft) high and 1,592 metres (5,223 ft) long. The lake behind it can hold more than 12 cubic kilometres (9,700,000 acre⋅ft) of water. The dam provides water for agriculture in Central Washington. Water is pumped from Lake Roosevelt to Banks Lake, located in the Grand Coulee. From there it runs by gravity to irrigate about 2,700 square kilometres (670,000 acres) of fertile farmland. Incorporated in the late 1940s and early 1950s, this scheme is known as the Columbia Basin Project. Grand Coulee also produces hydroelectricity. In fact, it is the largest electric-power producing facility in the United States. 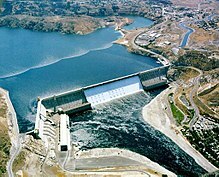 At full load the dam can produce 6,809 megawatts or enough for 5 million typical American households. The dam was an important source of power for factories during World War II. Today, it provides much of the cheap electric power for the Pacific Northwest. Among other benefits include flood control for the lower Columbia River and recreational boating and fishing on Lake Roosevelt. As a consequence of the dam's construction, the reservoir flooded large tracts of Native American lands. Salmon can no longer migrate to the upper Columbia River system. This page was last changed on 26 February 2019, at 13:47.